The University of Florida’s Arts in Medicine (AIM) program has now expanded to offer a Master of Arts in Arts in Medicine. Enrollment begins this year for Fall 2014. AIM is a well -established program that has been leading the field for over 20 years. UF’s Shands Hospital has an artist-in-residence program with artists ranging from dancers, musicians, painters, poets, writers and more. These amazing artists work with patients, families and others on the unit in the hospital. They put on performances in the lobby of the hospital and other venues. They work with senior citizens centers. And the work these artists are doing is truly heart-warming. People with Parkinson’s disease are able to improve mobility through dance in the Dance for Life program. Cancer patients express their feelings about the disease through poetry writing, painting and more. Children create art together in the children’s units under the direction of the artists in residence. Writers assist patients to tell the stories of the patient’s life. All of the art programs are conducted by working artists. The AIM program engages in research to reveal the benefits of art in healthcare. The program works with the community in various programs. 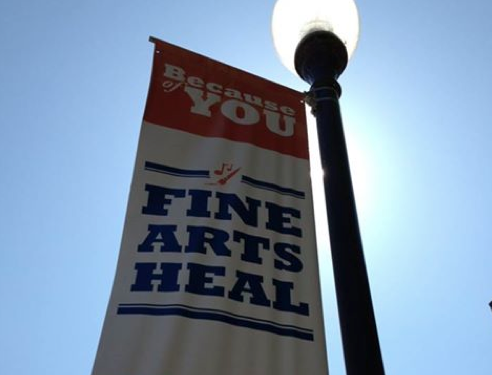 Follow the links to learn more about the program and all the many exciting ways art is being used as a healing tool at the University of Florida’s Arts in Medicine program. This entry was posted in art, art in healthcare, Uncategorized and tagged Art, art in healthcare, artists in residence. Bookmark the permalink. Cool! I’d love to see that.